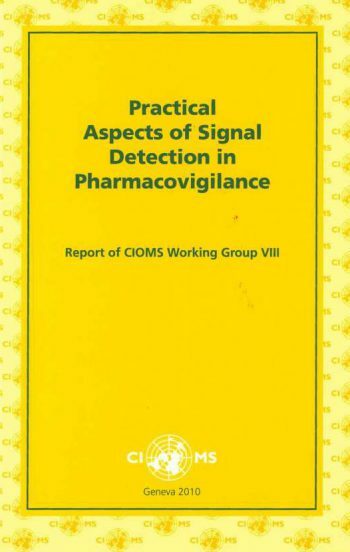 CIOMS publication – Practical Aspects of Signal Detection in Pharmacovigilance. Report of CIOMS Working Group VIII. The conclusions of this Working Group were finalized and published in 2010. In 2006, based on requests from some drug regulatory authorities and a number of pharmaceutical companies, CIOMS set up a working group of senior scientists (from drug regulatory authorities, the pharmaceutical industry, and academia) in order to develop consensus Points to Consider in the development and application of quantitative methods for signal detection using pharmacovigilance databases. The publication contains key definitions of pharmacovigilance, taxonomy of drug safety signals, description of approaches to signal detection including both traditional and statistical data mining methods and interpretation of results. Data elements, mechanisms and different systems of spontaneously reported data including discussions on limitations and challenges of spontaneous data are presented. Signal detection strategies and program, stakeholder perspectives and signal management are also addressed. Finally future directions in signal detection, evaluation and communication are elaborated. October 2008, Medicines and Health Products Regulatory Agency (MHRA), London, UK.